Padraig shows a natural empathy towards the people he encounters, being in awe of the sea himself and hugely interested in the people who live by it in all seasons. Whether conversing with fishermen, artists, musicians, sailors, experts or novices, he has a natural flair for putting people at ease and a mischievous sense of humour. Pádraig has been involved in traditional boat building for over thirty years and has been instrumental in the preservation of the craft in Ireland. In 1994 he founded Meitheal Mara, a co-operative which builds and repairs traditional boats, located in the heart of Cork city. 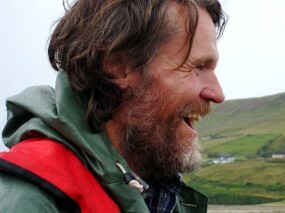 Muintir na Mara is both a personal and spiritual voyage for him and he encounters many remarkable characters over the six programmes, such as Bernie Winters, a farmer from Clare Island who uses the organic methods of his ancestors and Micheál O Monacháin, boatbuilder and blacksmith from Kilgalligan. He spends a memorable day in Inishmurray with Dr. Prannie Rhatigan, author of seaweed-based cookbook Irish Seaweed Kitchen, and her fisherman husband Johnny Waters. He develops a taste for kite-surfing under the guidance of Caroline Moore who has recently started her own business. There are few places on the Irish coast as rich in folklore as the deserted islands of the Inishkeas. 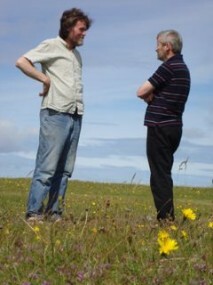 Padraig hears about the adventures and hardships of island life from one of the island’s descendants, PJ McGinty, as he walks among the ruins. 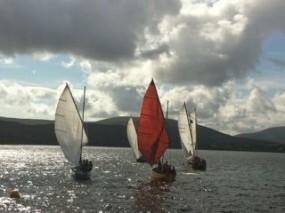 During this epic journey along the coast Pádraig also comes head to head with the contentious issues facing Ireland’s coastal towns these days such as over-regulation of the fishing industry, the impact of multinationals on communities and the natural environment and the demise of the fishing community and tradition. Pádraig Ó Duinnín is a man of the sea and his character is the driving force behind this series; his love and respect for the sea and sea-faring traditions shine through as he traverses this magnificent stretch of the Irish coast.